The story is about this religious cult whos leader Nix promises his followers eternal life. Swann, an ex member of the cult, gets cold feet and decides he wants out of the cult of freaky people and decides to eliminate the cult and its leader Nix. He manages to stop Nix and bury him….but is he dead? Many years later after these events Swann has become a David Copperfield type of magician winning big money. But suddenly some people are after him and there’s rumors that Nix…the cult leader he laid to sleep might be returning for revenge on those who restrained him. Swann included. The good thing about this movie for me is that it takes us into this world of magic, demons and religion in a very credible way. Barker handles things properly in this film by taking us into fantastic territory but with a touch of realism. As if it all could in fact be true. Thats the feeling I got while watching this film. And ultimately thats what makes the film so effectively creepy. Nix is a great villain and I never for once felt I was watching some actor playing a by the numbers villain just for the kicks of it. Daniel Von Bergen as Nix delivers a great and evil performance. He uses anyone and everyone, he is selfish in his quest for ultimate knowledge and power over the supernatural and will do anything to have it. The guy is pure evil…and when he is about to be re awakened you almost feel sorry for the poor dopes who are doing it. Another one of the movies assets is that it is done in the fashion of an old detective flick, with Scott Bakulas character Harry D Amour as the grounded on reality Detective who is constantly being confronted with the fact that this world is filled with things that we know nothing about. 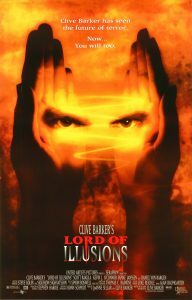 We see the film through Harrys eyes as he plunges himself deeper into the world of magic and Illusion. This is a smart lead character and cool thing about it is that you don’t feel like its a bunch of teenagers making mistake after mistake, this guy knows what he is doing, he is a detective taking a full plunge into the dark world of Nix’s religious cult. But by far the coolest thing about this movie is its story. Barker carved up a fine spooky tale. Something to really scare you. The story is complex, and keeps you interested all through out, like a good mystery should. Not only that, but he directed the film with some real style. The movie just looks beautiful in everyway. A really good example of this is Swanns Illussion show in which he performs his “Last Illusion”. Great sets and music in those sequences. Speaking of the music, as is the case in most of Barkers films, the music elevates everything to another level of grandiosity. You get this feeling that you are watching something epic and forbidden. All in all, I would say that no doubt this is Barkers finest film to date. Its got a great involving story, good performances a great and memorable villain and a feeling of realism even though we are dealing with magic and Illusions. Barker is a master at weaving fantastic and dark fantasies, this my friends is his best one, go check it out!